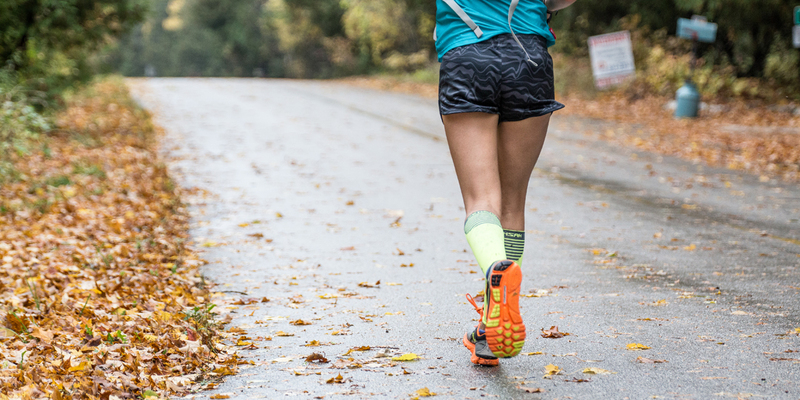 Cognitive Behavioral Therapy and ultra running: How I used CBT to run 100 miles. I bet you’d never think that therapy for my depression would help me travel 100 miles on foot, but it did, in the most amazing way. If you’ve run any sort of running race you know that a HUGE chunk of it is mental. If your mind is in the wrong place it can totally wreck your race. 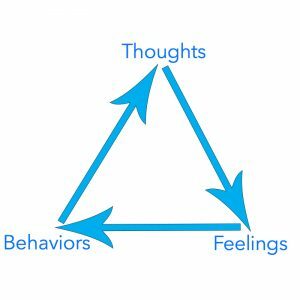 Cognitive Behavioral Therapy or CBT is a form of psychotherapy that focuses on how a person’s thoughts, beliefs and attitudes affect behaviors. We can look at this process as a triangle. Our thoughts create our feelings and our feelings create our actions. This creates a never ending loop (Psychology Today). Going into the race I was struggling with an injury to my hip. In the weeks leading up to the race the pain wasn’t quite pain, it was more annoying than pain. While the pain never really went away before the race I decided to run anyway. If I had to stop during the race I would, but I decided to worry about that when it happened and LIVE IN THE MOMENT. Which leads me to mindfulness. When doing something difficult, it’s easy to get caught in a loop in which we dwell on negative thoughts and feelings. To snap myself out of negative thoughts and stop myself from even forming them I lived in the MOMENT as much as possible. When I started to get bored, I’d focus on something outside of myself. For example, if I saw a leaf falling from a tree I’d watch the direction, speed, and color of that leaf until I either passed it or it hit the ground. I’d watch the pattern of the leaves sprinkled on the trail or listen to the sound of my feet hitting the ground over and over again. In a way, I’d hyper focus on outside stimuli to distract myself from negative thoughts. Mindfulness can definitely get you through a rough spot. One cognitive distortion I often find myself trapped in is jumping to conclusions and the fortune teller error. When a person makes this error they anticipate that things will turn out badly and that the future is already written (“15 Common Cognitive Distortions”, 2018). However, as with many things in life, we cannot predict the outcome with any sort of certainty. In my case, during the race I knew that there was a chance that I wouldn’t be able to finish AND there was also a chance that I would finish just fine. I accepted that I could not see into the future and all I could really do was run. I decided I would face the challenges when they arose, rather than before. Which takes me to the Magnification or Catastrophizing distortion. When this distortion happens in peoples’ minds, they are exaggerating the importance of what is going on(“15 Common Cognitive Distortions”, 2018). In my case it could have been worrying about getting hurt, having to drop, thinking the pain will be unbearable, etc. While those are all legitimate worries, dwelling on them could be extremely toxic to the result of the race. Instead of worrying about what wasn’t certain to happen and things I couldn’t control, I simply ran. Visualizing was also a huge part of my success. I visualized my friend Andrea and her smile, I thought about how I’d see her at the aid stations with that smile and her excited reactions. 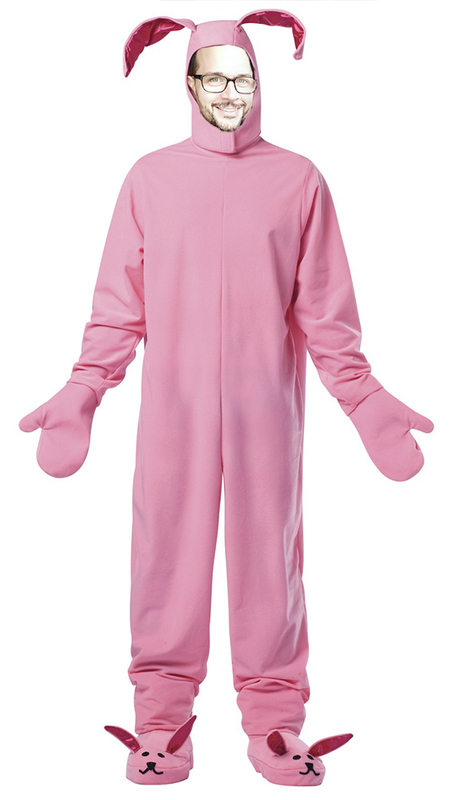 I thought about my boyfriend Andrew dressed up in a pink bunny suit as Ralphie in the “Christmas Story” movie. I thought about my friend Joy and her strength and kindness and how she helped me get through hard days. Visualizing these positive people in my life pushed me mile after mile. You can change your visualizing techniques to fit your needs; visualize the finish line, the meal you’ll eat after, the finisher swag, your kids, whatever you need really! But keep your mind on those things that make you happy and keep you positive. Before going into the race I told my crew what I needed. I needed to be surrounded by positivity. I needed to see smiles all around. I needed to hear that I was doing well, and I looked relaxed and I needed to hear laughter. I asked them to tell me jokes and make me laugh as much as possible throughout the day. As a result I found myself laughing and making jokes. Smiling and laughing affects your mood because of what happens in your brain. Endorphins are released when you smile, they are triggered by the movements of muscles in your face. Endorphins make us feel happy and lower stress. As endorphins increase in your system, cortisol is reduced (Smith, 2017). Cortisol is your body’s main stress hormone that is known for its ‘fight or flight’ instinct (“What Is Cortisol,” 2016). During a race, it can only help to keep that cortisol level down. The amazing thing about Cognitive Behavioral Therapy is that it is NOT a one size fits all approach. There are many cognitive distortions that we may struggle with, and some we may not. The trick is, to find what works for you and your brain. In the end, using these methods takes practice. For example, when I began using some of these methods I was overwhelmed and worried about THINKING about how I was THINKING. Doesn’t that just sound exhausting?! As I’ve practiced and used some methods, I’ve learned that the more I flip that internal thought process around, the LESS I need to think about it. Running seems to parallel life in that there are many paths, up’s, downs, bumps, successes and failures. We can use tools and strategies that help us get through life in running and find peace and hopefully success…. “Cognitive Behavioral Therapy.” Psychology Today, Sussex Publishers, www.psychologytoday.com/us/basics/cognitive-behavioral-therapy. “15 Common Cognitive Distortions.” Psych Central, 29 Oct. 2018, psychcentral.com/lib/15-common-cognitive-distortions/. Smith, Jennifer. “7 Benefits of Smiling and Laughing That You Didn’t Know About.” Lifehack, Lifehack, 14 Nov. 2017, www.lifehack.org/articles/communication/7-benefits-smiling-and-laughing.html. “What Is Cortisol?” WebMD, WebMD, www.webmd.com/a-to-z-guides/what-is-cortisol#1.